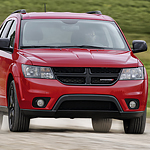 What Exterior Upgrades are Included in the Blacktop Package on the Dodge Journey? Color, contour, and presentation are the qualities that provide the first impression from friends, co-workers, and neighbors. Getting a look that says something about you is not often an option. In 2018, Dodge is offering a Blacktop package for the Dodge Journey that knocks the socks off competing models. The upgrade to the Blacktop look is available with the SE, SXT, and GT trims of the Journey. The exterior is all black with gloss black on the exterior mirrors, headlight bezels, handles, and front grille that accent your black ride with a dark spark. In the front, the black front fascia is lower, giving a frowning effect. From the side, the 19-inch glossy black aluminum wheels shout darkness while you drive. On top sit the black roof side rails like folded wings. Come to Charbonneau Chrysler Center and view your new Blacktop Journey for yourself.